(17/P118) TRENTON – – The Christie Administration’s Superstorm Sandy Blue Acres Buyout Program has reached another milestone with its 500th demolition, a house that was taken down in Cumberland County’s Lawrence Township, Department of Environmental Protection Commissioner Bob Martin announced today. The Blue Acres program is an important part of the Christie Administration’s comprehensive strategy to make New Jersey more resilient to storms, using federal and state funds to acquire residential properties in flood-prone areas from willing sellers and then preserve the land as open space to absorb storm surges. The 500th demolition, a house on Paris Road, took place in the Bay Point section of Lawrence Township, an area of Cumberland County that is prone to dangerous flooding. 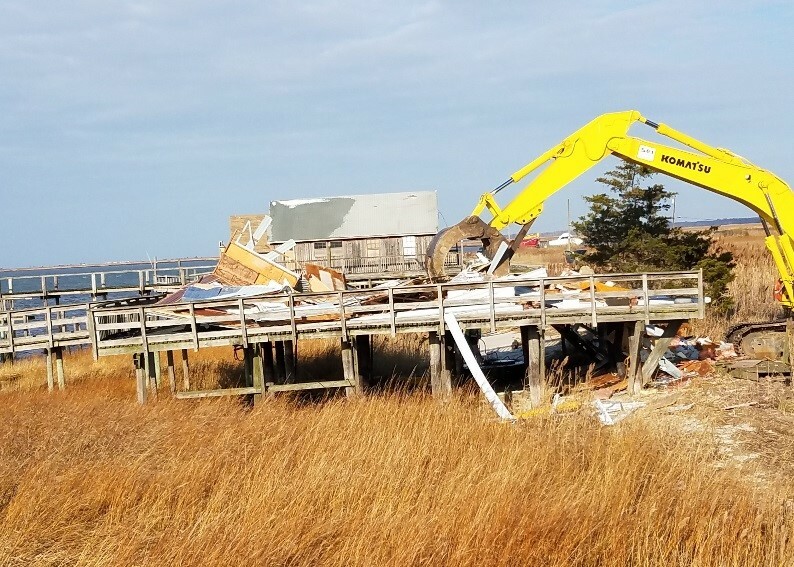 A contractor for the state has been working for the past two weeks removing 20 storm-damaged homes as well as pilings and docks from 14 additional lots. The $1.2 million project is being carried out by Hammonton-based Site Enterprises Inc. The Blue Acres Program and its acquisition practices have earned national recognition, including awards from FEMA and HUD. To date, the Blue Acres program has acquired 618 properties. The program has made offers to a total of 893 property owners, of which 690 have been accepted so far. Bay Point is about 15 miles southwest of Millville. The properties being taken down are located on an extremely exposed and narrow barrier island flanked by marshlands. 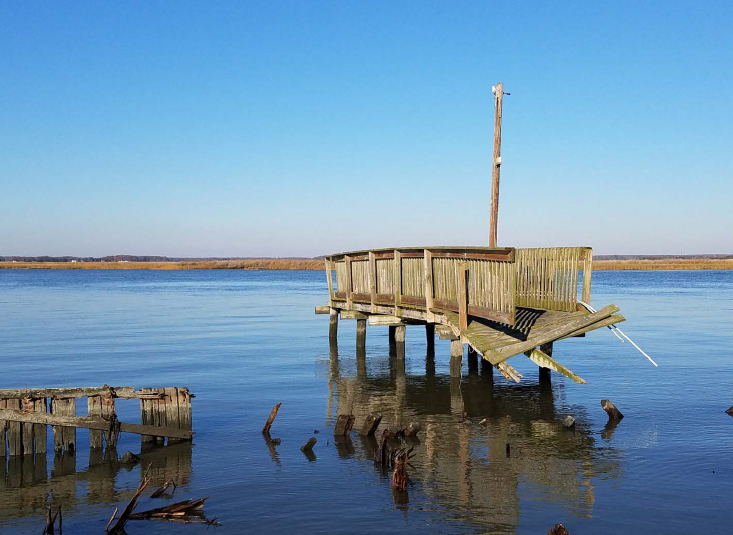 Due to the need for demolition work to occur in water and the fact that the area is ecologically sensitive, Blue Acres was required to secure permits through the U.S. Army Corps of Engineers and the DEP’s Land Use Regulation program. Consequently, the demolitions are timed to avoid impacts to species of migratory shorebirds, horseshoe crabs and other wildlife in this ecologically sensitive area, which will eventually become part of a state Wildlife Management Area. In 2013, Governor Christie designated Blue Acres to run the state’s post-Superstorm Sandy effort to purchase homes from willing sellers at pre-Sandy values. The program was subsequently expanded to include acquisitions in communities that may not have been directly impacted by Sandy but are still prone to repetitive flooding from rivers, creeks and other water bodies. The $375 million in funding for Blue Acres buyouts comes from $185 million provided by the Federal Emergency Management Agency, $175 million from the U.S. Department of Housing and Urban Development, and $15 million from the Blue Acres and State Land Acquisition funds within the DEP’s Green Acres Program. After a Blue Acres purchase, homes are demolished and the land is permanently preserved as open space for recreation and/or conservation. The goal is to purchase clusters of homes to provide areas that will absorb flood waters and better protect municipalities. The Blue Acres Program has been active in 14 municipalities: Sayreville, South River, Woodbridge, Old Bridge and East Brunswick in Middlesex County; Manville in Somerset County; Pompton Lakes in Passaic County; Newark in Essex County; Rahway and Linden in Union County; Lawrence and Downe in Cumberland County; New Milford in Bergen County; and Ocean in Monmouth County. The program is also conducting preliminary work with local officials to initiate programs in several other coastal communities. The Blue Acres Program complements a wide range of storm-resiliency efforts spearheaded by the DEP, including construction of a statewide system of engineered beaches and dunes, development of protective standards for elevating homes in coastal areas, protecting and improving water and wastewater infrastructure, and assisting local governments with flood mitigation projects. The DEP has also launched a comprehensive study with the U.S. Army Corps of Engineers into strategies to reduce flooding from back bays and other coastal waterways.